you're right... so i guess there is one other way on planet earth to get these 65W iris pro parts... but a 21.5" screen is attached... i hope apple makes an imac mini iris pro. I am suprised it isn't mentioned here that Gigabyte is planning to release BRIXs with mobile dGPUs as well. This is interesting and I hope Anandtech will cover this as well and compare their performance with the 4770r. Obviously, having dGPU in a BRIX format defies the need for 4770R somewhat. the combo-setups will be 1) AMD A8 APU + Radeon HD 8890M, 2) Intel CPU + Radeon HD 8890M, 3) Intel CPU + Nvidia GTX 880M. You can even see the stickers Gigabyte put on their BRIX models showcased at the CES in your own gallery here: http://anandtech.com/Gallery/Album/3311#8 . 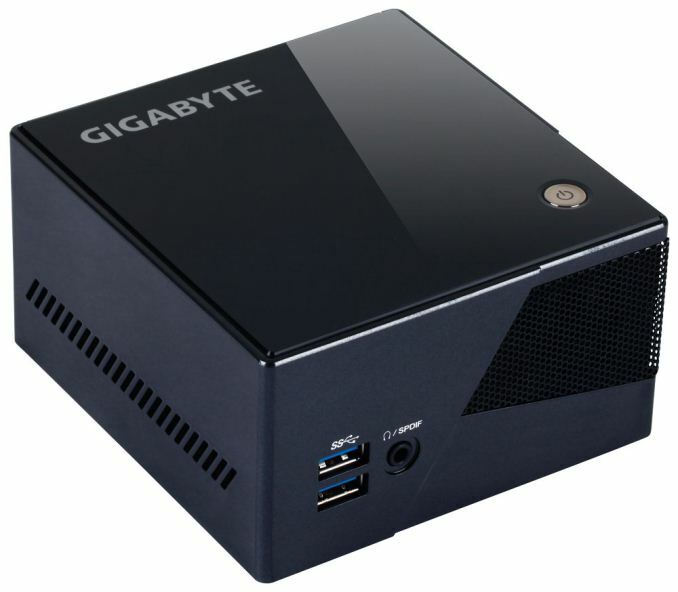 I would also like to suggest to look at how the dimensions of the Gigabyte Pro motherboard relate to the NUC dimensions. Is it 1:1 as far as size goes? Or 1:1 as far as formfactor goes: are the screwholes dimensioned the same? Lastly, I would like to suggest this: In a lot of the practical gaming tests that are done with iGPUs, I don't see 1080p resolutions being tested. Today this is becoming outdated, since not only the 4770R in this BRIX Pro unit, but also the Kaveri a10-7850k (as well as the 65W(!) rated a10-7800 which I believe shares the same iGPU but is clocked a bit lower cpu wise) are capable of gaming at these resolutions. I mean, see this for what we have coming our way: http://www.youtube.com/watch?v=axyHkKn_e80 pretty insane. So, please Anandtech, start incorporating 1080p gaming in your benchmarks. A game like cs:go on 1080p would be awesome. I am planning to use either the new kaveri or this 4770r for this game but I'm not sure it will handle it. Wow, didn't know about the 880M one. I'll second the call for 1080p benchmarks. 1440p benchmarks are fine, but the latest Steam Hardware Survey has 1440p at less than 1% still. 1080p has 32%. Next down is 1366x768 at 23%. thanks for the review, i would have like to seen at least 2 or 3 gaming benchmarks (non-synthetics). another reason to test cs:go is that it is a steam-released game (by Valve). Seeing how the BRIX Pro is presented at the CES as a steambox as well, testing itt would make sense.